It’s not surprising that people have lashed out a bit against that statement, as it’s always a bit strange when news writers speculate that only female politicians will be affected emotionally and career-wise when it comes to girly things such as babies, pregnancies and the like. It’s almost as if some writers were trying to make a controversy out of nothing at all, speculating what role the baby will play in a hypothetical, possible, run for the 2016 US Presidency. 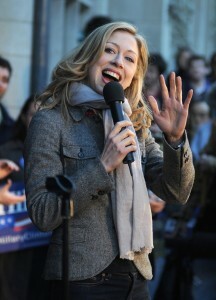 Both Hillary and Bill are thrilled and will be affected positively because of Chelsea’s pregnancy. After all, they did both take to Twitter themselves, tweeting that they were ‘so happy’ and ‘thrilled’ for Chelsea and Marc, respectively, and that they were both excited about their ‘new titles’ as grandparents. Whether or not you think any of this hype and speculation is worth your time or not, it’s definitely interesting to consider that stories such as these are only propagated because Clinton is a female politician, who may favour with the American public because she’s a grandmother. However, I really do hope that the American people look beyond that, if she does decide to run for presidency, because there really is much more to Hillary than her expecting grandchild – she is herself a powerhouse. This entry was posted in News, Politics, World and tagged gender, Hilary Clinton, News, politics, world. Bookmark the permalink.